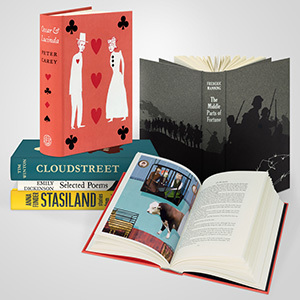 To celebrate the fortieth birthday of Australian Book Review’s second series and indeed its 400th issue in April 2018, we are offering two prizes for subscribers – superb books from The Folio Society worth a total of more than $400. This prize is open to any new or renewing subscribers worldwide who take up or renew a print or online subscription to ABR for two years or more. To enter, simply visit our Subscriptions page and renew or take up a new print or online subscription to ABR for two years or more to automatically go in the draw. This promotion is open to participants from any country. If you are one of the two winners, ABR will contact you to confirm your postal address and then pass this on to The Folio Society for delivery of the books.